In 2018, contractor crews from Tapani, Inc. built two roundabouts to improve safety and improve mobility through the intersection of State Route 20 and SR 20 Spur in Anacortes. This intersection is used by an average of 30,000 vehicles a day. The intersection of these two roadways has significant regional importance to those who live on and visit nearby island communities. This area experienced heavy congestion during the busy tourist months, backups were severe and increased the chance of collisions. Traffic turning west toward Whidbey Island often backed up beyond the turn lane, leaving vehicles stopped on the highway, increasing the chance of rear-end collisions. Many design options were discussed during the 10 year history of this project. During many community meetings and events, the traveling public shared that improved safety and bicycle and pedestrian accommodations were priorities at this intersection. It was determined that a roundabout was the practical solution to relieve the problems the community identified - safety and congestion. To improve mobility throughout the entire area, the project design also included a roundabout at the Miller Gibralter roads intersection, right-in right-out only access through the corridor and a pedestrian and bicycle trail along the highway. Improving this intersection and the surrounding area has improved traffic flow, helping improve safety by reducing the frequency and severity of collisions and lowering amount of time vehicles spend idling. The cost of this project was $13.4 million dollars, which came from the Connecting Washington transportation package. 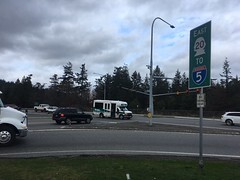 This 2018 Connecting Washington project was built at SR 20 and SR 20 Spur in Anacortes. On April 2, 2018 contractor crews started construction on this intersection improvement project. The roundabouts were both open to traffic on Saturday, June 23, 2018.